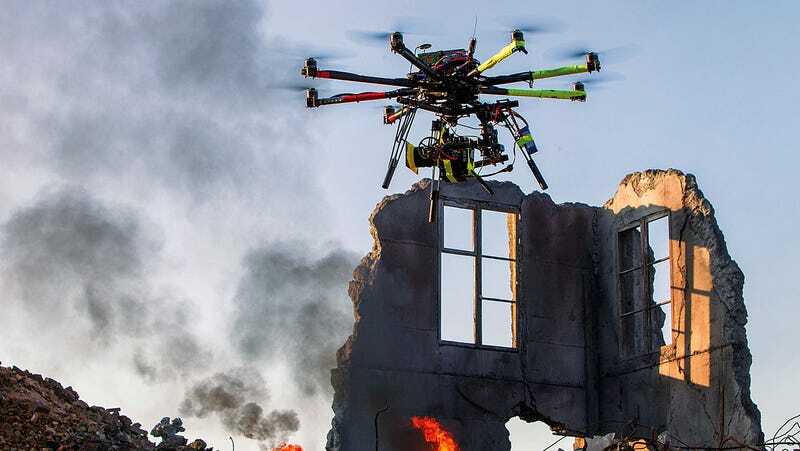 Camera-mounted drones have been used to stunning effect in blockbuster films such as Skyfall and Iron Man 3, though restrictions on the commercial use of unpiloted vehicles have made it difficult for filmmakers to use the technology. But that changed this week when the FAA granted exemptions to six movie studios. Until now, whenever filmmakers wanted to shoot footage with a drone, they typically took advantage of other nations' more lenient prohibitions to film scenes abroad. But, as The Hill reports, industry insiders are hopeful that the movie magic that drones create will not only make the U.S. more competitive, but will also ease public fears and lead to wider adoption of the technology. Under the exemption granted to the film studios, drones can only fly up to 400 feet and must be kept within sight of the person operating the machine. The studios will also have to apply for new certificates from the FAA every time they fly a drone in a new location — something that happens frequently when shooting TV shows and movies. The new exemptions could make more companies more aware of the fact that they need to get some type of FAA approval before flying their drones, or else run afoul of federal regulators. "The impact is going to be that you will now have a safe, regulated industry using [drones], and the sort of Wild West mentality of some of the folks that are buying these and using them will be diminished," said John McGraw, a former FAA official. In the long run, the FAA's embrace of drones could encourage companies to stay in the United States instead of relocating to other countries to use or experiment with the technology. Google, similarly, recently announced that it has launched experiments with drones to compete with Amazon at delivering goods. Because of restrictions in the U.S., the service is being tested in rural Australia. "I know of countless other companies that have effectively fled the United States in order to develop and use the technology in a place where governments are more receptive," said Brendan Schulman, the head of law firm Kramer Levin's [drone] practice. He has criticized the FAA's current approach. As the Washington Post has noted, drones give cinematographers a unique advantage over traditional filmmaking methods. They have more reach and range than a crane. They're often more nimble than a helicopter. And that means directors can pull off risky, real-world acrobatic shots that would otherwise have to be created on a computer. "Ten years ago, when you wanted an action sequence you did them at 18 frames a second, then projected them at 24 — so that you could do them slow but it looks fast," Emmanuel Previnaire, an academy-award winning drone cinematographer told the Washington Post. "Now everything has to happen fast. It's become a very demanding industry in terms of motion control."